Earlier in the year, we reported that Netflix could be moving into merchandise for its original content based on a job listing that was spotted on the company's website. Flash forward several months, and we are now seeing those merchandising plans come into full effect – seemingly just in time for the October 27 release of Stranger Things 2, the highly-anticipated second season of what is one of the most popular and well-recognised shows on Netflix. 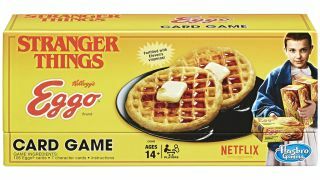 In the US, Netflix has teamed up with Target for a Stranger Things merchanding deal that will see the retail giant sell a number of officially-licensed items based on the TV phenomenon. Everything from card games to Christmas sweaters will be up for grabs for feverish fans of the show. While some might see this as another cash grab from a company that's already worth over $80 billion, it could be just what Netflix needs to take its business to the next level, putting it in a place where it may soon rival the likes of Disney, according to Business Insider. If there's one thing to glean from this information, it's that it can only mean good things for Netflix users. More money for Netflix means more chances for the company to expand its library and take risks on the kinds of original TV shows and films it chooses to fund. While 2017 saw the cancellation of a number of fan-favorite Netflix shows, including The Get Down and Sense8, it was announced yesterday that the streaming giant is currently working on over 80 new original films and 30 new anime series, as reported by Polygon. Clearly, Netflix's growth is showing no signs of slowing down any time soon, and subscribers will see the benefits of that growth via a greatly expanded library of (hopefully Sandler-free) films and binge-worthy shows. This could also provide more merchandising opportunities for both new and existing Netflix Original shows, which would make pop culture fans and collectors quite happy. I don't know about you, but I'd totally buy some GLOW Funko Pop Vinyl figurines and T-shirts, and why hasn't Netflix started selling "Horsin' Around" Christmas sweaters yet? With the recent news that Netflix would be hiking its US and UK prices once again leaving a sour taste in the mouths of subscribers, we can only hope is that the added revenue brought in by Netflix's merchandising deals will eventually make price hikes less of an occurrence. We'll have to wait and see about that, but in the meantime, things are looking quite good for fans of the service.